Mother's Day is almost here. Don't be a slacker and forget to get mom something. Here are 10 gifts any stoner mom would love to receive. Obviously, if mom enjoys the herb, she will probably enjoy a new piece. So, head on down to your favorite shop and check out all that great glass. Try to pick out something unique and with some nice colors that remind you of her. Does mom dig wearing jewelry? Well, if so, hit up her favorite jewelry store and get her something that will remind her of you every time she wears it. It doesn't have to be expensive, just thoughtful and something that reflects her personality. If your mom is a bookworm, then, by all means, pick her up a good book by her favorite author. The pro move here is to also write a sweet inscription inside that she'll see the first time she goes to read it. What stoner mom doesn't like to receive some flowers? Head down to the local flower shop and let them know what your mom likes. They'll hook you up and help you to create a memorable bouquet. Additionally, if mom gardens, you can substitute a few plants from the garden shop that your mom can plant in the garden. She'll soon be puffing away outside, marveling at the dope new plants you just got her. Does mom have a sweet tooth? If she does, then think about scoring her some good chocolate. Whatever you do, get that janky box of stale chocolates at the grocery store either. Find a store that sells some good imported or artisanal chocolate. This is your mom. Get her the good stuff! If your mom enjoys a nice glass of wine, then, by all means, get her a bottle of one of her favorites. If you are unsure what to get, most decent shops will have someone to help advise you on choosing the perfect bottle. A glass of wine will accompany a little herb nicely, helping mom to have a relaxing and mellow night. Haven't been around as much as you should? Then why not take mom out to a nice dinner and a movie afterward. This will give you time to catch up and spend some quality time together. Smoke up before you both head into the movie, making it that much more fun. Mom likes to smoke, so a couple grams of her favorite strain is a good move. But hey, don't just hand her the herb in a baggie. Buy one of those nice jars made specifically for keeping your weed fresh, and give it to mom with her favorite green inside. If she's not much of a toker and prefers edibles, then score her some delicious ones, putting them in a nice box before you give them to her. Show your mom you really care and get her an appointment with a good masseuse. She can enjoy some herb, and then have the masseuse caresse all her stress away. This is a gift she'll really appreciate if she deals with any aches and pains like a sore back. If your mom is one of those mom's that likes keeping things smelling nice with scented candles or one of those plug-in air fresheners, you should think about picking her up some BluntPower air freshener. 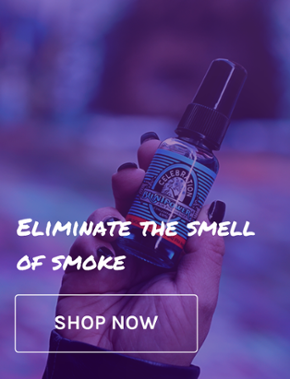 BluntPower is a high-end, oil-based, concentrated air freshener, that will have mom dumping the candles and plug-ins and enjoying the freshness that BluntPower provides. So, hit up the website today and pick out a few delicious scents you know your mom will love.